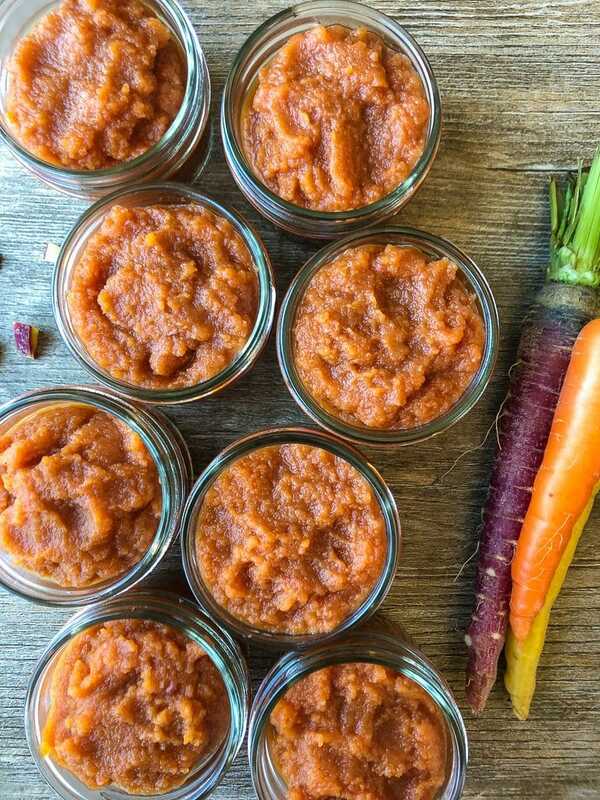 Homemade Carrot Apple Sauce is loaded with antioxidants and vitamins essential for good health. It’s great to feed to kids, especially for a tasty way to sneak in some veggies, but it’s also adult approved! It’s quick and easy to make, plus it freezes great to have on hand. Did you know some of the baby food on store shelves is actually older than your baby?! I was pretty shocked when I found this out. The first years of a baby’s life are critical because of rapid growth and development so good nutrition is very important. 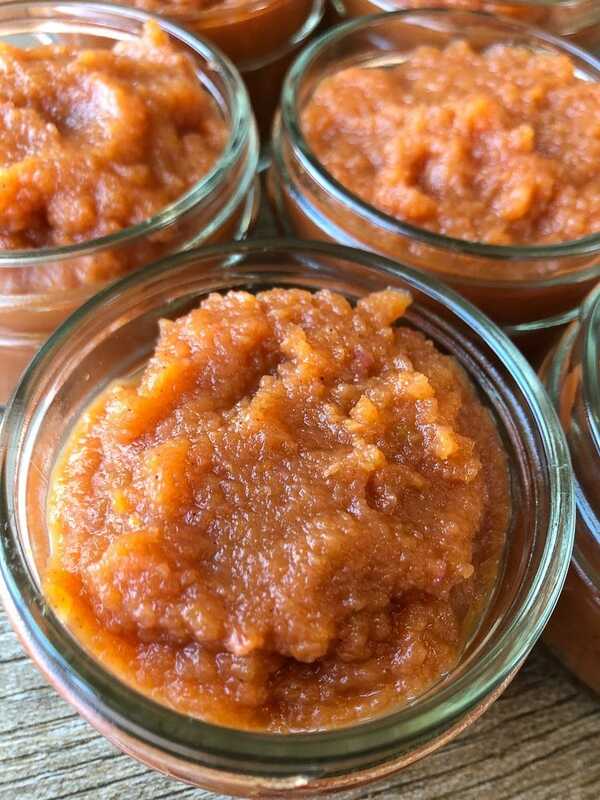 The ingredients in this apple sauce will help with brain development, aids in digestion, boosts immune system function and more. It’s full of anti-cancer properties, healthy fiber and it is great for bone development. I cook the carrots, not only to get them soft for blending, but cooked carrots actually have more health benefits than raw. It’s the opposite for the apples. I keep them raw for benefits. They blend pretty easily that way too. This Carrot Apple Sauce can look different colors depending on what color carrots are used. The one pictured is a mixture of different carrots. To get a vibrant purple color just use purple carrots. 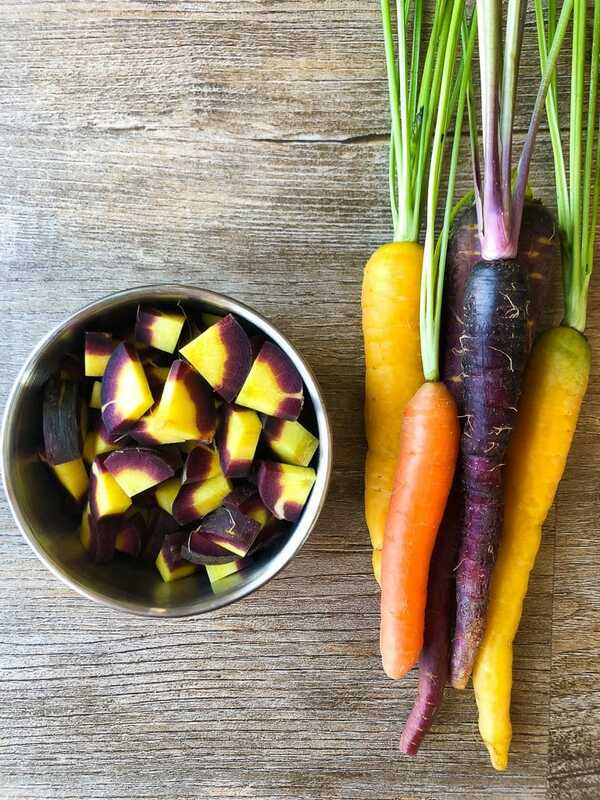 It’s fun to use the rainbow carrots to see what color it will turn out, but also there are lots of different nutrients in the different colors to give baby a variety of health benefits! I don’t like to use ‘baby carrots’ because not only are they more expensive, but most are given a chlorine bath before packaging. Chop carrots and boil them in water until they are soft. Set the carrots aside and let cool while peeling and chopping (raw) apples. The apples can be boiled if you’d like, but as I said before, I like to keep them raw for the health benefits. I’ve found they still blend well especially when they are peeled. For blending, I put the apples in the food processor first, and blend until it turns into apple sauce. Then I add the carrots and flax and blend everything together. Depending on the size of your food processor, and how much you’re making, it might need to be blended in separate batches. Then, put it all in a big bowl and mix it together. Make sure to taste in case you need to adjust any of the ingredients. Then scoop the mixture out into small glass containers for individual servings. I prefer using glass over plastic because of all the hormone disruptors that leach from plastic containers, even BPA-free ones. Side note: my son has dropped these from his high chair on the floor and they didn’t break! The glass containers store well in the freezer and that’s where I like to keep this apple sauce to ensure it doesn’t spoil before use. It’s also nice to have something nutritious on hand for my son to eat. The frozen apple sauce can be defrosted on the counter a few hours before eating, or just pull one out the night before and put it in the fridge. It will be thawed out by morning. 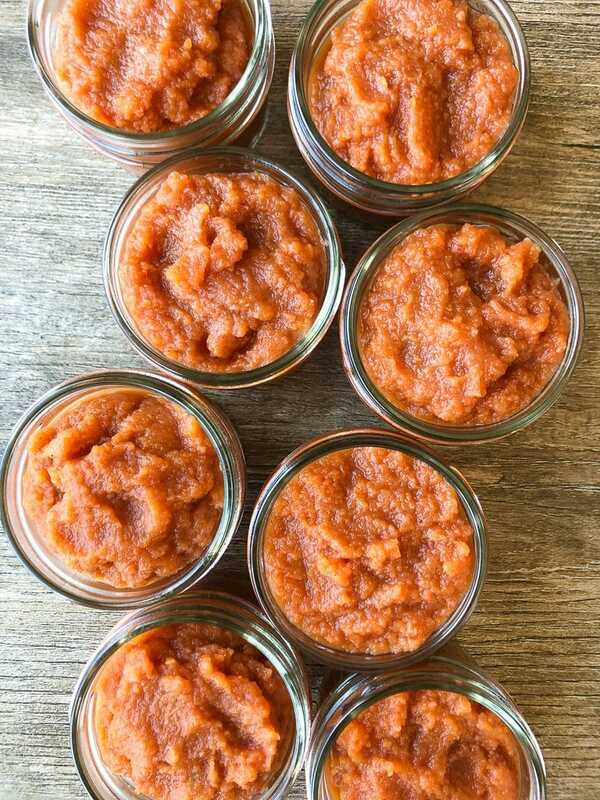 I will make a big batch of this every other weekend to leave me with two weeks worth of apple sauce. It’s takes less than an hour and it also takes stress away when my little one is hungry and I need to feed him asap! Toddlers aren’t known to have high levels of patience. Ha! I’d love to hear if your little one enjoyed this, or leave a comment below with ways you sneak veggies into their diet! This recipe makes enough for 8 glass jars. They easily freezer for a convenient, healthy snack for your little one. Please use all organic ingredients when possible! First, add the chopped carrots to a pot of water. On a stove top, bring the water to boil. Lower the heat somewhat, but keep it boiling a little. Cook until carrots can easily be poked with a fork. About 15 - 20 minutes. Drain the carrots and let them cool off. Peel and chop your apples. (I usually do this while the carrots are boiling.) The skin can be left on the apples, but if you're feeding this to a baby, it's best to remove. Add just the apples to a food processor and blend until it turns into apple sauce. Then add the carrots and ground flax and blend again. It should be all mixed together. Scoop the mixture into the individual glass jars and then store in freezer. Depending on the size of your food processor, and how much you're making, it might need to be blended in separate batches. Then, put it all in a big bowl and mix it together. Make sure to taste in case you need to adjust any of the ingredients. My son has dropped these glass jars a few times from his high chair and they have not broke! I love how you added carrot! Perfect healthy addition to apple sauce!